A man stabbed a Brooklyn mother and her four children to death in a rampage last night. It should go without saying that if the victim family had access to a firearm, they may have been able to stop the killer before he completed his bloody business. When the astrological Bloodbath Formula appears in the sky above a gun-controlled city, innocents often die. actual time unknown - reported as "late"
1. Pallas sesquiduadrate Pluto. Pallas represents the libertarian non-aggression axiom. When Pallas (or ruler) is weakened by any aspect with Pluto or any discordant aspect with Jupiter, normal ethical constraint against violence is compromised. 2. Venus quintile Neptune. Neptune weakens or dissolves the normal Venusian respect for property rights, including the right to control one's own body. 3. Pluto opposite Jupiter, ruler of Venus. Venus here represents the owned resource that is one's own body, here colored by the planet of death. 4. Mars on IC square Pluto; IC probably ruled by Mercury which is septile Pluto. 5. 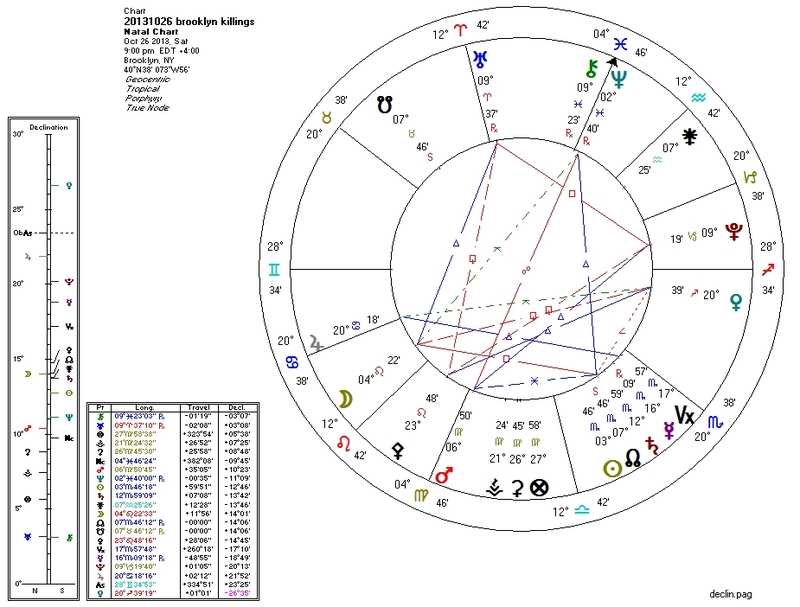 Sun co-ruled by Pluto and co-ruled by Mars which is trine Pluto. The day, represented by the Sun, becomes a carrier for violent energies. These factors will be present in some form for a few days. The Venus-Neptune connection will weaken but the Mars-Sun-Pluto connection will strengthen. We hope for the best, but there may be more bad news coming.